It is widely known that very shallow areas are at times hot spots for seabass. The benefits of a naturally swimming lure can be reaped in such areas, where otherwise only topwater lures could be used. 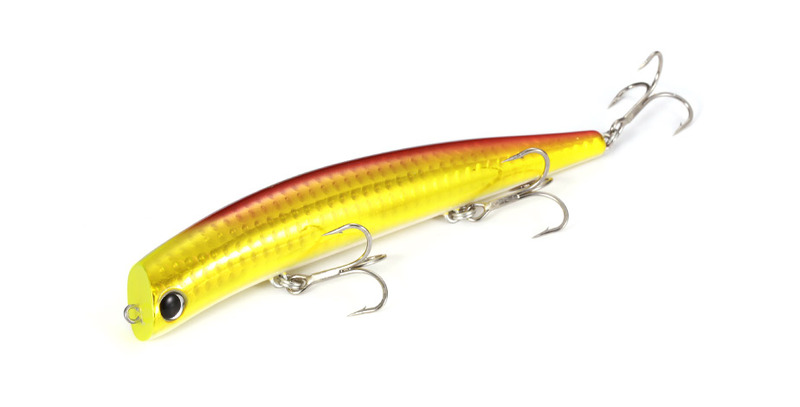 The lipless slim minnow is the choice lure for shallow, previously inaccessible areas. The top priority in the design of this extra-shallow minnow was that it does not dive while still sufficiently catching the water. It will trace a course 10-30 cm below the surface and has sufficient buoyancy to give a good response even while being retrieved extremely slowly. This lipless lure has a natural and distinctive “wobble and roll” action caused by the head and the body itself catching water. With the slightest changes in the water resistance or current, the lure will perform irregular movements under the surface, giving the game fish a great opportunity to bite. Productive mainly in the areas of shoaling beaches and shallows near estuaries, this lure can also trigger a bite from seabass sensitive to slowly drifting prey near the surface.